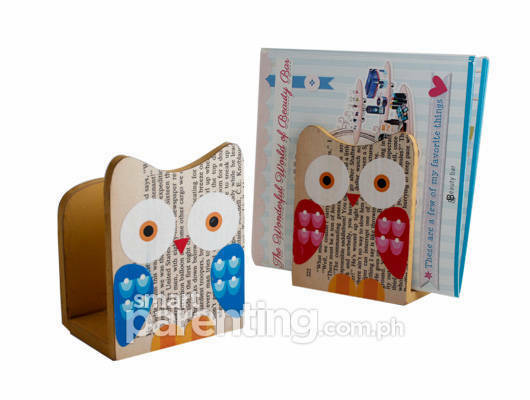 Check out these owl-some decorative and functional items! As I was sourcing for items to feature for this week’s Goodie Bag, I was so tempted to buy some of the items! That’s because I’m in the process of decorating my room, and I’m always on the lookout for stylish pieces. And this sturdy metallic wall hook would be a great addition, because it’s got a clean design and I could hang my bags and accessories on it! It feels good to have brought home a lot of the clutter that’s been steadily growing under my office desk. And having just the essentials in my workspace, I can focus more on work and on organizing my things. And this handy helper will do just the job. I can place memos, reminders and other trinkets for safekeeping with this. I remember seeing my dad’s key holder when I was young. It was downright confusing. Plus, they all looked alike! And these days, we can’t be dilly-dallying when opening car doors or the house gate. You need to know which key goes where, pronto. 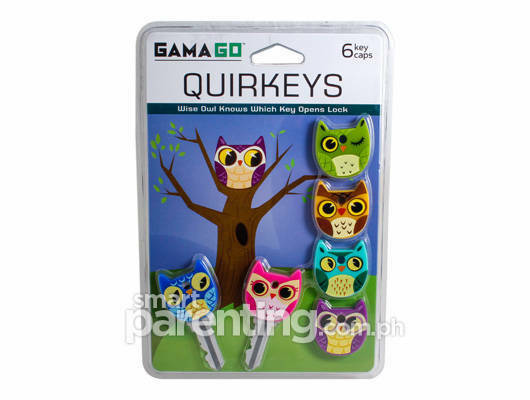 So when I saw these owl key caps, I loved them for their creativity and cuteness. Get to assign an owl for all your lock opening needs! I find that there’s something very elegant about white items, no matter what their purpose is for the home. And these days, styling the house means finding items that serve a double purpose, while working as chic décor. 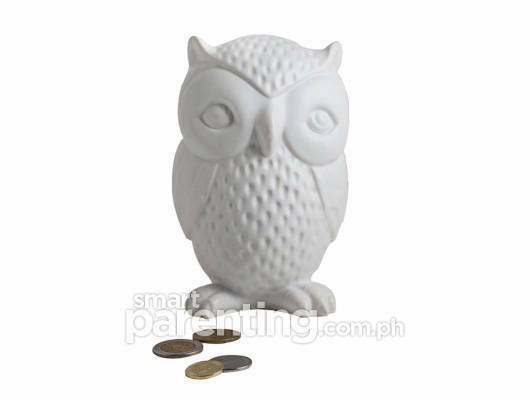 Just like this owl coin bank, which could work as a bedside accent, a book rest, or a splash of white on a bookshelf. One of the first Disney movies I ever got to watch as a child was Bambi, and I could never forget the owl that would help watch over the forest. 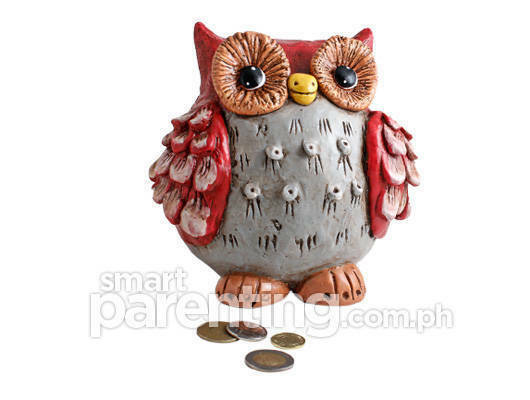 He had that wise, charming, grandfather-like quality about him, and when I saw this bright and colorful owl coin bank, I immediately remembered that specific character. 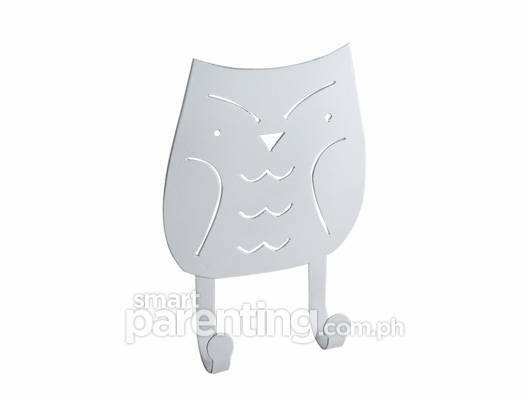 Teach your child the value of saving up the fun way by filling this feathery friend’s tummy up. Remember when sticking glow-in-the-dark stars, dinosaurs and what-have-you on your ceiling was the craze back in the 90s? It instantly lit up your room at night but in a subtle way so your kid wouldn’t have to be scared to sleep on his own. 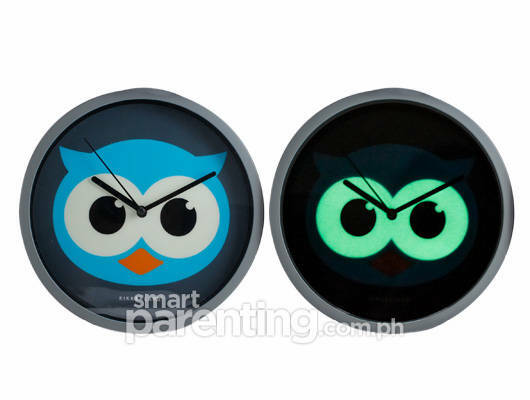 In the same manner does this clock work, except it’s an owl’s clock that glows in the dark! It was definitely not a challenge at all to come up with a list of wonderful owl-themed decorative collectibles, because they’re everywhere! And they truly do lend a touch of whimsy and childlike charm to any product. 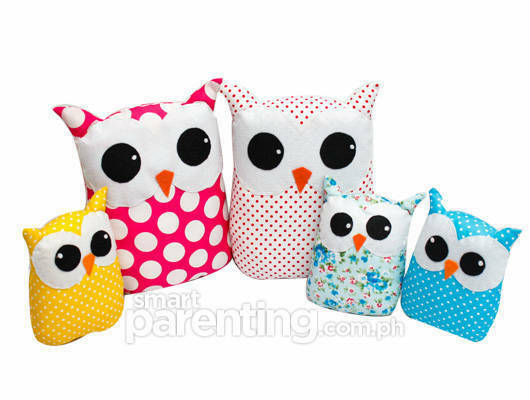 Just like these adorable plush fabric owls from Cai Sio of Paper Chic Studio. 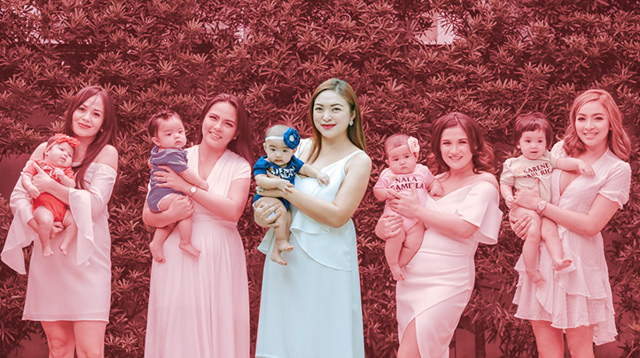 They come in all sizes and designs, plus, they’re washable too. I’m still looking for the perfect storage item for things on top of my closet, because when they’re covered in plastic or gathering dust, they become rather unsightly. 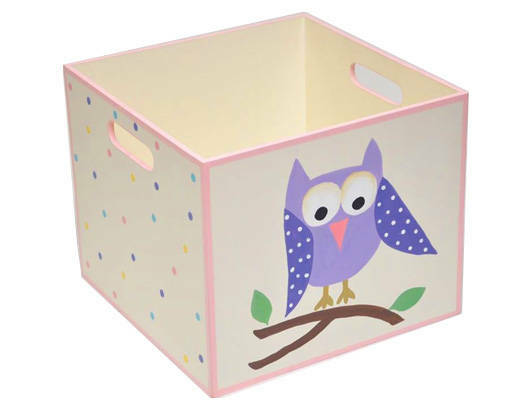 Thankfully, I discovered these charming crates from Two Tots Home Accessories. They’re sturdy enough to carry heavy items and the hand-painted design adds a soft, feminine touch to any room. A particular item of interest that instantly catches people’s eye when they check out my room is a painting a special someone did for me. It instantly makes the room seem smaller—in effect, cozier, and you can create the same feel for your child’s room with beautiful painted pieces featuring subjects like their favorite characters or animals. 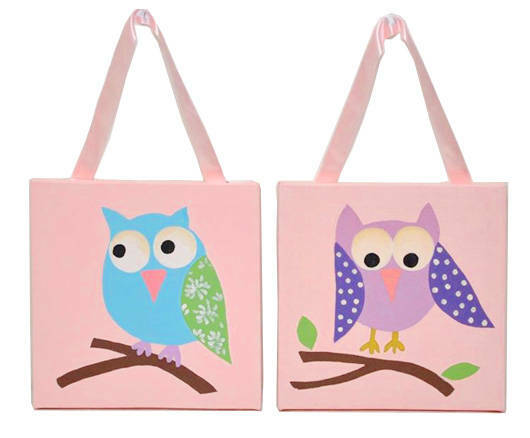 This hand-painted owl wall painting has that calming effect with the charming artwork and pastel colors used. Yesterday, I cleaned out my jewelry and accessories case and re-discovered those that I had not worn for the longest time. And if there’s one thing that I would love to have more of, it would be lovely charm bracelets such as this one. 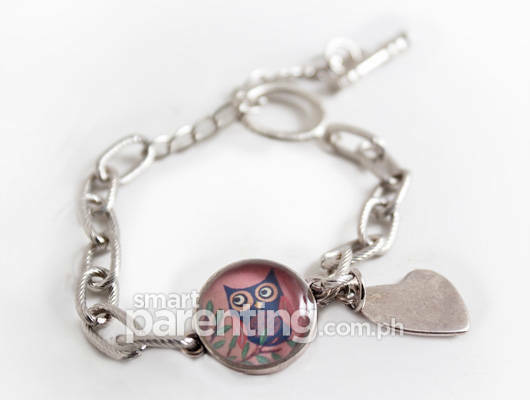 The chain is a simple silver made endearing with the heart and owl design. 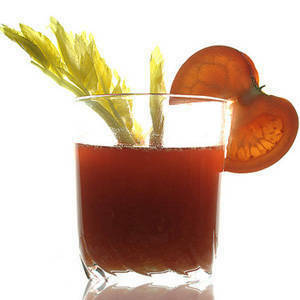 It could work as a great present for any important woman or girl in your life.